CMC Vellore PG Admissions 2019 – Christian Medical College (CMC) Vellore PG Admission 2019 is done on basis of NEET PG 2019 entrance exam conducted by National Board of Examinations. Only candidates, who have qualified in the NEET-PG 2019 by obtaining a minimum of marks at 50th percentile, is eligible for admission. Eligible and interested candidates must apply for CMC Vellore PG Admission 2019 at www.admissions.cmcvellore.ac.in. The last date for uploading the NEET PG 2019 score & rank at the CMC Vellore website is February 20, 2019. Details of form submission, seats available, and other relevant information for postgraduate admission at CMC Vellore are given here. Please go through this carefully before filling the form. Latest: The last date for uploading the NEET PG 2019 score & rank at the CMC Vellore website is February 20, 2019. Click here to upload the NEET PG 2019 score. The application form was available ONLY online. PG NEET 2019 (Step 1) qualified candidates only are eligible for admission. Candidates who have qualified for the M.B.B.S Degree, compulsory rotating residential internship and full registration before March 31, 2019, are eligible to apply for the postgraduate diploma and degree courses. Online submission of AR number and rank of TN Management Quota for self-financing colleges – 2019 To be announced! Counseling by Selection Committee, DME, Tamil Nadu To be announced! Date of joining To be announced! Postgraduate Degree / Diploma Courses for which admission are offered in April 2019 are given below. CMC Vellore Application Form 2019 can be accessed only online through the Christian Medical College, Vellore website as per the schedule given above. Duly filled application forms must be submitted online with administrative fee and registration fee. Candidate needs to send all the supporting documents to the Office of Registrar, CMC, Vellore – 2, by post, on or before the date last. Online payment using payment gateway (credit or debit card/net banking). As a challan, at no extra cost, at any branch of ICICI bank in India. A challan will be generated when filling payment details in the application form. Please mention FC- CMC-V on the challan and send the original challan. Note: Application fee will not be refunded under any circumstances. Please read the instructions carefully before filling the form. Only candidates who have obtained a minimum of 50th percentile in the NEET-PG 2019 will be considered for admission. Take a printout of the application for your file. Supporting documents must be sent to the Office of the Registrar, CMC, Vellore 632002 to reach on or before the last date. PG NEET 2019 qualified candidates only are eligible for admission. Minimum of 50th percentile in NEET-PG 2019. Candidates who have qualified for the M.B.B.S Degree, completing Compulsory Rotating Residential Internship before March 31, 2019, and obtained full registration before TN Management Quota counselling. Candidates having a postgraduate diploma pass certificate may apply for the two-year postgraduate degree (MS/MD) course in the same subject. Note: Those who complete a DCP will not have this benefit for MD Pathology. Those with a service obligation will need to have completed the same by May 31, 2019. Minimum of 50th percentile or revised applicable minimum qualifying percentile in NEET-PG 2019 as determined by the Government. The selection of candidates for Postgraduate courses is based on NEET PG 2019. The total number of seats, in clinical specialities at least 80% of seats are reserved for Minority Network candidates from the CMC network, while 20% of seats will be for candidates with proof of two years fulltime service in areas of need (Service). At least half of the Service seats (10% of the total seats) will be reserved for minority candidates with such service (Minority Service). 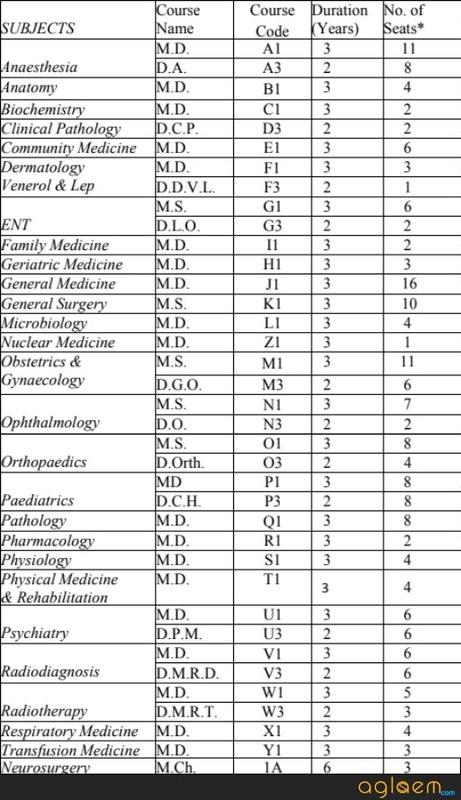 In pre and paraclinical specialities, at least 50% of seats are reserved for Minority Network candidates. A Minority Network candidate may be allotted a General Merit/Service/Minority Service seat, if available at the time of his/her counselling. A Minority Service candidate may be allotted a General Merit/Service seat, if available at the time of his/her counselling. A Service candidate may be allotted a General Merit seat, if available at the time of his/her counselling. All Candidates should pay the following fees at the time of registration for the course. The fees will be collected for the whole course as one installment, at the time of registration. To check full information about CMC Vellore PG Admission 2019, Download Information Bulletin.